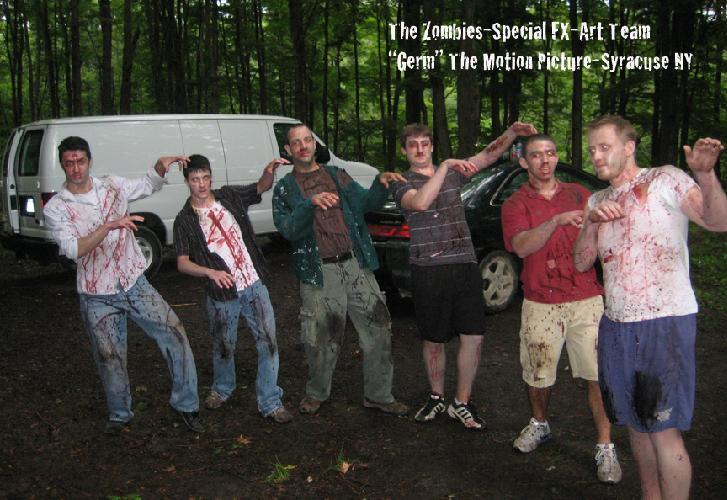 Motion Picture Title: Germ-Zombie Extra’s On Set- (2009) –(Assistant Art Director-Bryan Matthew Boutwell –Responsible for Special FX, Make-up, Set Design, Props. -Acting Roll-zombie. Film Location=Syracuse NY) This photo was taken of the extra zombies running through the woods in one scene. We were between takes, so we had them line up and make their best Thriller pose. It was getting late in the day when this photo was taken. We had already been on the set for 14 hours straight. We were exhausted and I had made about 25 gallons worth of blood over the day. We were getting silly and having fun. There is a special bond that people make when working on a full-length feature movie. You spend on average 16 hours a day for 23 days straight on set. It’s an amazingly unique experience.